Half of the Czech population (50 %) considers the country’s membership of the European Union and its membership of the North Atlantic Treaty Organisation to be equally important. Among those who differentiate between the two institutions, those who consider NATO membership to be more important (34 %) clearly outnumber those who favour EU membership (16 %). More than a two-thirds majority of Czech citizens (69 %) supports the Czech Republic’s membership in NATO, with one-fifth disapproving (22 %) and one-tenth choosing to give an evasive answer (9 %). In an atmosphere of increasing population dissatisfaction with the country’s membership in the European Union and the prevailing sense of a threat from migrants, it is interesting to take a look also at the public’s attitude to the military institution of which we are a member – the North Atlantic Alliance. In the period before the Czech Republic’s accession to the EU and NATO and after the country’s accession to NATO (1998), the number of people who considered joining the European Union to be more important than joining the North Atlantic Alliance was greater. In 2011, in addition to the almost fifty percent of the population who considered membership in the two institutions to be equally important, support for NATO and the EU had evened out. In 2012 the proportion of citizens who favoured NATO was higher. The current survey has further amplified this difference. 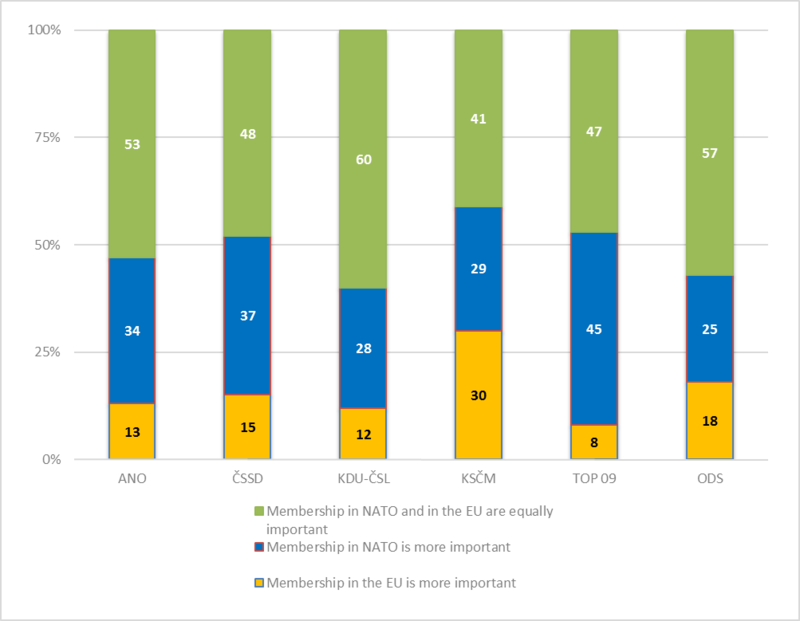 The proportion of citizens who consider membership in NATO to be of greater importance is double (34 %) the number of people who favour EU membership (16 %). Nonetheless, the number of citizens who consider membership in both institutions to be of equal importance has remained consistent at fifty percent. As expected, public attitudes towards Czech membership in the EU and NATO vary depending on attitudes towards the country’s European Union membership itself. The vast majority of citizens who are satisfied with Czech membership in the EU believe that membership in the two institutions are of equal importance, and within this grouping there is a similar proportion of people who are only pro- NATO or only pro- EU. Those who are somewhat dissatisfied with EU membership are representative of the population as a whole. 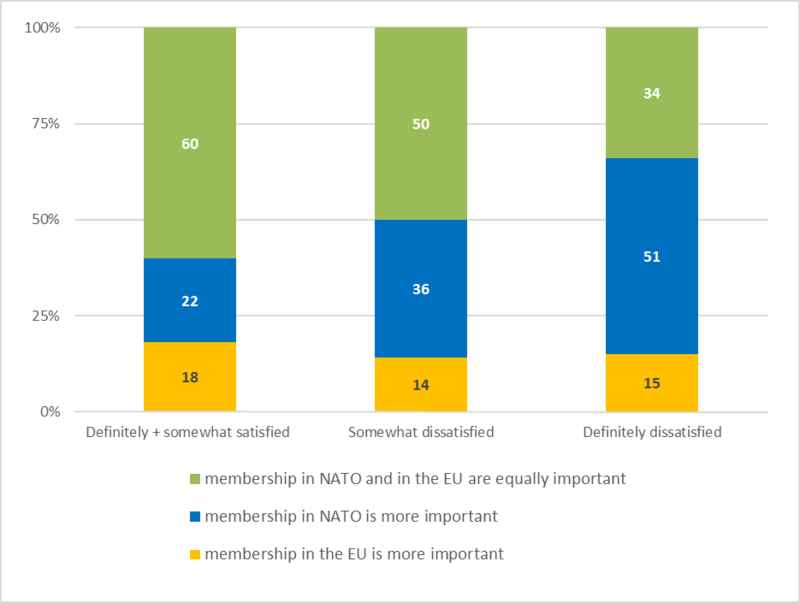 The vast majority of people who are very dissatisfied with our membership in the EU consider membership in NATO to be of greater importance, while one-third of those who consider membership in the two institutions to be of equal importance are in this group. The fact that an over two-thirds majority of Czech citizens support the country’s membership in NATO demonstrates our strong attachment to this institution. Only one-fifth of the adult population is currently against membership in NATO, with one tenth avoiding giving a definitive answer. The STEM surveys conducted over the years since the Czech Republic’s accession to NATO, show that NATO has consistently enjoyed the support of the majority of the population, surpassing 70 % in 2000 (for the purposes of a time comparison, we have left out evasive answers such as “I don’t know”, “I can’t judge”). 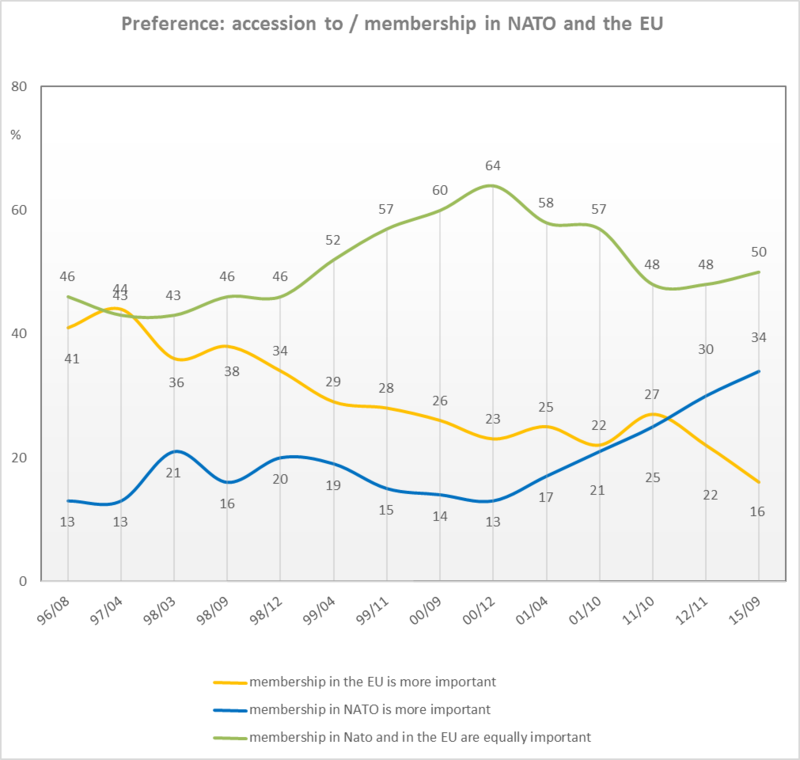 In subsequent years, the level of approval for membership in NATO has remained relatively stable, at in and around 70 %. The only deviation was in 2009 when, during the Czech EU Presidency, there was an increase in pro-European sentiment among the population which also impacted positively on support for NATO. 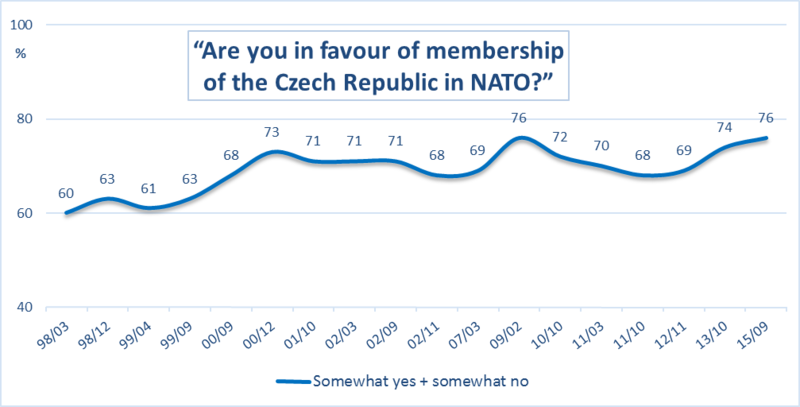 The current survey again demonstrates that a three-quarters majority of the population supports Czech membership in NATO (excluding “I don’t know” answers). Younger people and the better educated are more likely to be in favour of membership in NATO. Nonetheless, the majority of citizens over 60 and those with only a primary school education also support NATO membership, although less so than respondents in the other age groups and education categories. Membership in NATO also enjoys majority support across the political spectrum, regardless of parliamentary political party affiliation, with the obvious exception of Communist Party (KSČM) sympathisers who can be divided into two groups of almost equal size. TOP 09, a conservative party, and the liberal-conservative Civic Democrat Party (ODS) are the right-wing opposition parties; KDU-ČSL is the Christian Democrat party and one of junior coalition partners; ANO is a centrist political movement, one of the junior collation partners and the youngest one; ČSSD is the ruling Czech Socialist Democratic Party; KSČM (Communist Party of Bohemia and Moravia). It is interesting how the opinions of Communist Party supporters on the North Atlantic Alliance affect their attitudes when comparing Czech membership in NATO to membership in the EU: Communist party supporters are the only grouping who favour membership in the EU over membership in NATO, while at the same time this grouping has the lowest number of individuals who believe that membership in the two institutions is of equal importance. (Given their low representation in the group, figures for KDU-ČSL, TOP 09 and ODS supporters are only approximate).